On January 26, 2005, when she replaced Colin Powell, Condoleezza Rice became the first African American woman to serve as secretary of state. She came to the office after a distinguished career as a political scientist and after having served as President George W. Bush’s national security adviser. Earlier, she had served President George H. W. Bush as an expert on Soviet affairs. 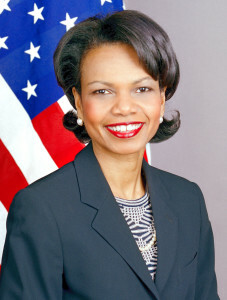 As secretary of state, Rice proved controversial because of her role in the U.S. war in Iraq (2003– ).